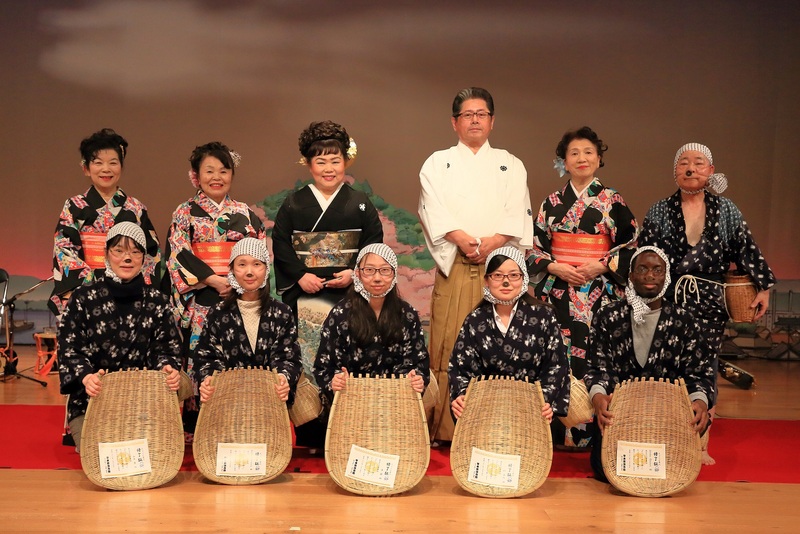 This article below introduces the remarks and comments written by CIR (Cordinator of International Relations) of Shimane Prefectural Government who visited Yasugibushi show and tried Dojou-sukui dancing. 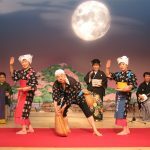 One of Shimane Prefecture’s traditional performance arts is called “dojou-sukui” (the loach-scooping dance), a humorous dance that is combined with the resounding rhythm of the shamisen and drums of the resounding folk song, Yasugibushi. 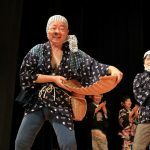 We were able to enjoy hearing Yasugibushi live at the place of its origin, and learn how to do the male portion of the dojou-sukui dance while receiving instruction from a professional dancer at the Yasugibushi Performance Hall. 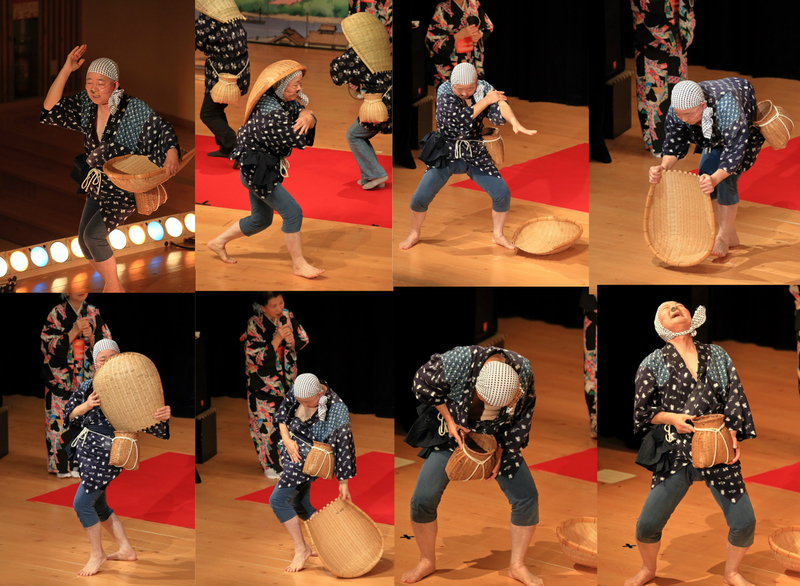 Though there is both male and female dance within dojou-sukui, the male dance is well known for its comical facial expressions and movements all over Japan and people from various places visit to enjoy this dance. Well then, let’s first take a look at the outfits that the dancers wear. There’s the kimono with a splash pattern, a cloth called “tenugui” wrapped around their head and there’s something attached to their noses. There are many people who think that it is a 5 Yen coin, but they are actually real copper coins that were used during the Edo period! There are a number of theories regarding why the dancers attach the coin to their noses, but it is a comical dance, so it wouldn’t be too far-fetched to say that it is because they want the audience to laugh. Ok, now let’s take a look at the dance. The dancers attach a small wicker basket for storing the loaches to their waist, wear a wicker draining basket on their head, and walk onstage while thrusting their pelvises. They take off the draining basket and first show off a wide grin to the audience. Then, they search for loaches, scoop them up when they find them, get rid of the mud and dirt that they scoop up with the loaches, and finally slide the loaches into the small wicker basket. When they do this series of movements, one can vividly picture them scooping up loaches. At the end, they shout “ARA, EH-SASSA!” while exiting the stage. 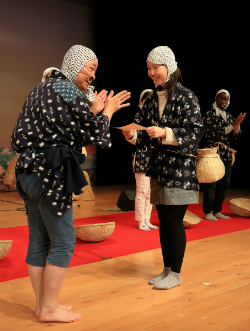 The dojou-sukui dance is joined by the Yasugibushi folk song, making the experience even more enjoyable. This time we were taught many things about Yasugibushi by Ms. Iemoto Watanabe Oito the Fourth. The song that is sung can be made to have a positive atmosphere, but it can also be made into a requiem, there are many lyrics for the song, and it can also be improvised according to the situation. It is very rare. 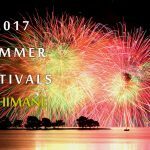 Ms. Iemoto has performed not only in Japan, but also in China, Russia, America, and more. Even if the audience doesn’t understand the words, they could sympathize with performance arts that overflow with a simple humanity, such as a beautiful song and a fun dance. 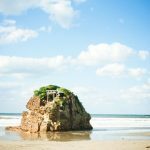 In the past Yasugi Port was very prosperous, being the place where rice and metal were exported, and it appears that there were many drinking parties. The youth from the neighboring districts would scoop loaches from the small rivers and eat them as snacks to go along with their drinks. When they danced a dance similar to the act of scooping loaches, they received enthusiastic applause from the crowd. This dance went well with Yasugibushi, and wherever you could hear a Yasugibushi performance, you could also watch the Dojou-sukui dance. 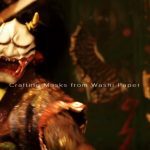 Apparently, Yasugibushi continued to develop and spread throughout the general public. Loaches are abundant with Vitamin D and good quality protein, so it is said that they are good for your health. 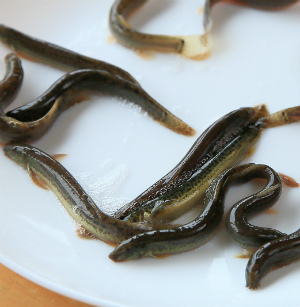 Yasugi city is the prominent location for breeding loaches, with about 4 tons of loaches bred in one year. 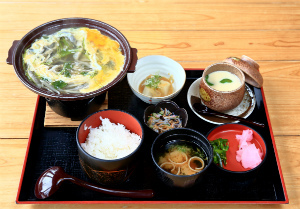 You can eat various dishes featuring loaches such as a loach hotpot, or fried loaches at the “Dojou Pavilion,” of the Yasugibushi Performance Hall. It was a short time, but when I tried to mimic the comical expressions and movements, I became engrossed in the experience. When we finished learning, we received Certificates of Completion, and fun memories.